A diversion to avoid the clogged pre-Christmas traffic heading up the Pacific Highway turned into a culinary and visual delight. 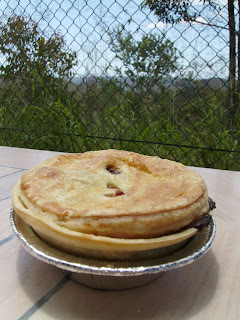 Pie in the Sky, a modest cream building squatting high above the Hawkesbury River is a favourite stop-off with many of the motorbike riders who relish the rises and corners of the Old Pacific Highway. Beef, lamb, vegetarian and sweet pies, as well as sausage rolls, are all available to take-away. If you're travelling at a more languorous pace and are keen to savour the view as well as the pastry, you can have them served on a plate with a choice of sides, such as mushy peas. With SG already claiming the beef burgundy (my first choice), I went for the more exotic lamb, honey, chilli and garlic. All of the pies feature dream pastry: flaky and buttery on the top, firm enough on the bottom to retain structural integrity, but never too heavy. As you can see, there's no doubt that it's real meat on the inside. I wasn't overwhelmed by the sauce, however: the flavours weren't particularly distinct, so despite its ingredient list it wasn't notably hot, sweet or garlicky. 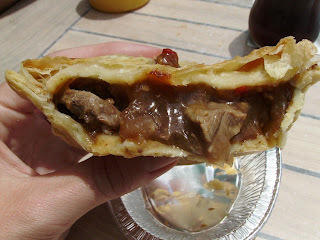 The plain steak and the beef burgundy were, however, exactly what one would hope for in an exemplary meat pie.